Amazon could announce free, ad-supported streaming service this week | What Hi-Fi? Amazon subsidiary IMDb is expected to reveal a free, ad-supported video streaming service on the Amazon Fire TV platform this week during Advertising Week, five people close to the matter have told CNBC. 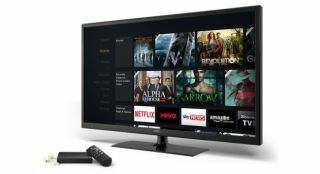 The service – similar to The Roku Channel – will offer any Fire TV device owner (and not just Amazon Prime Video users) free access to a library of older TV shows and films. News of the service was first published by The Information, who reported that it would be called Free Dive. The video platform, which would see adverts placed between content and on the player interface, would allow advertisers to collect first-party user and third-party consumer data to better target advertising. In turn, ‘Free Dive’ would allow Amazon to grow its advertising revenue in the TV market to better compete in the space. The retail giant is currently the third-largest digital advertiser, with Google and Facebook pushing out in front.